Evidence of brewing dates back to the fifth millennium BC and, despite thousands of years of practice, we’re still improving on the process today. Craft brewers work with a wide variety of ingredients and experiment with different flavors, but what about the process itself? Last month, a team of University of Pennsylvania students took a closer look at fermentation in beer-making. Their goal is to make the process of fermentation faster. 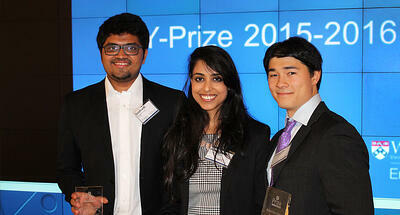 Their idea, Fermento, took home the big $10,000 prize at Penn’s recent Y-Prize Competition. Kinnek met with two of the winning team’s members, Siddharth Shah and Alexander David, to discover how their invention could impact brewing and what that means for craft brewers across the country. Kinnek: Brewing for a competition focused on biomedical engineering! Where did that idea come from? Alexander David: Our third teammate Shashwata Narain came across an article that talked about the different uses of microfluids, specifically with ethanol production. It also talked a little about applications in food and beverage, including fermentation. After a bit more research, we saw how big of an opportunity there was, especially with the recent craft brewing expansion. Kinnek: Can you tell us a little more about the process? You’re claiming you can make the fermentation process up to nine times faster? AD: The main goal of microfluids is to protect yeast cells from overpopulating and give them the space to convert sugars to ethanol. By compartmentalizing the yeast cell into tiny microscopic droplets, we can control the process and maintain an optimal ratio of yeast and sugar. Siddharth Shah: We’ve been able to perfect this process on a microscale in the lab. We’re currently developing a prototype device that can accomplish the same thing on a larger scale. Kinnek: How do you think this will affect the brewing industry as a whole? SS: With what we’ve been able to achieve so far, [it’s possible to] speed up the fermentation stage of the brewing process three to nine times. That will save brewers time, money and allow their products to reach the market more quickly. Kinnek: What are the costs associated with your technology? AD: The technology itself will actually be very affordable. The main expense will come from integration. Brewers might need new piping and new controls because of how the yeast and wort will be interacting with each other. 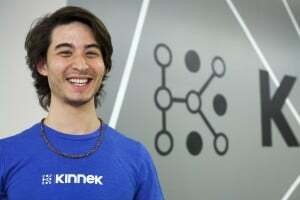 Kinnek: What are the next steps for your business idea? AD: We need to finalize our prototype and start using it on a larger scale. The biggest concern is that we don’t want it to affect the taste of the beer. We’ve received a lot of offers from large breweries and their brewmasters that can help us pilot the product. SS: We’re lucky that our team has such a unique and diverse skill-set so we have really great synergies. We’re hoping to be able to take it to market in the next few months. Thanks again to the team for sitting down and giving us a quick glimpse into what they’ve been working on. If everything goes according to plan, their technology could make waves in the brewing industry and set a high bar for future fermentation innovation. 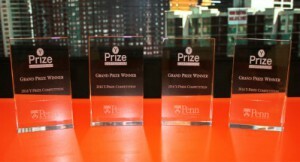 For more information about Fermento, please e-mail: shahsid@wharton.upenn.edu. Subscribe to our blog to get the latest Kinnek news!